A fluorescence microscope is much the same as a conventional light microscope with added features to enhance its capabilities. The conventional microscope uses visible light (400-700 nanometers) to illuminate and produce a magnified image of a sample. A fluorescence microscope, on the other hand, uses a much higher intensity light source which excites a fluorescent species in a sample of interest. This fluorescent species in turn emits a lower energy light of a longer wavelength that produces the magnified image instead of the original light source. Fluorescent microscopy is often used to image specific features of small specimens such as microbes. It is also used to visually enhance 3-D features at small scales. This can be accomplished by attaching fluorescent tags to anti-bodies that in turn attach to targeted features, or by staining in a less specific manner. 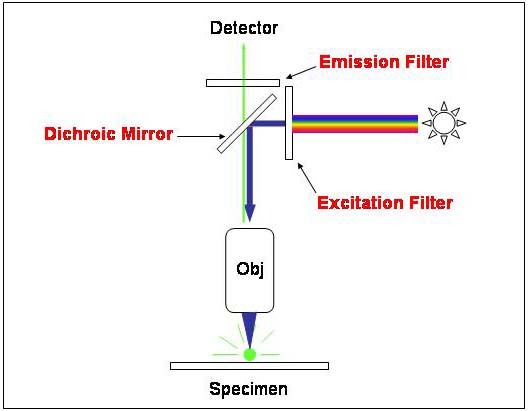 When the reflected light and background fluorescence is filtered in this type of microscopy the targeted parts of a given sample can be imaged. This gives an investigator the ability to visualize desired organelles or unique surface features of a sample of interest. Confocal fluorescent microscopy is most often used to accentuate the 3-D nature of samples. This is achieved by using powerful light sources, such as lasers, that can be focused to a pinpoint. This focusing is done repeatedly throughout one level of a specimen after another. Most often an image reconstruction program pieces the multi level image data together into a 3-D reconstruction of the targeted sample. How does Fluorescent Microscopy Work? In most cases the sample of interest is labeled with a fluorescent substance known as a fluorophore and then illuminated through the lens with the higher energy source. The illumination light is absorbed by the fluorophores (now attached to the sample) and causes them to emit a longer lower energy wavelength light. This fluorescent light can be separated from the surrounding radiation with filters designed for that specific wavelength allowing the viewer to see only that which is fluorescing. The basic task of the fluorescence microscope is to let excitation light radiate the specimen and then sort out the much weaker emitted light from the image. First, the microscope has a filter that only lets through radiation with the specific wavelength that matches your fluorescing material. The radiation collides with the atoms in your specimen and electrons are excited to a higher energy level. When they relax to a lower level, they emit light. 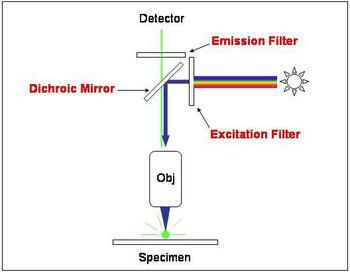 To become detectable (visible to the human eye) the fluorescence emitted from the sample is separated from the much brighter excitation light in a second filter. This works because the emitted light is of lower energy and has a longer wavelength than the light that is used for illumination. Most of the fluorescence microscopes used in biology today are epi-fluorescence microscopes, meaning that both the excitation and the observation of the fluorescence occur above the sample. Most use a Xenon or Mercury arc-discharge lamp for the more intense light source. The refinement of epi-fluorescent microscopes and advent of more powerful focused light sources, such as lasers, has led to more technically advanced scopes such as the confocal laser scanning microscopes and total internal reflection fluorescence microscopes (TIRF). CLSM's are invaluable tools for producing high resolution 3-D images of subsurfaces in specimens such as microbes. Their advantage is that they are able to produce sharp images of thick samples at various depths by taking images point by point and reconstructing them with a computer rather than viewing whole images through an eyepiece. Bradbury, S. and Evennett, P., Fluorescence microscopy, Contrast Techniques in Light Microscopy., BIOS Scientific Publishers, Ltd., Oxford, United Kingdom (1996).